Wheel of Fortune © 2010 Raw Thrills. To begin the game, insert the proper number of credits. 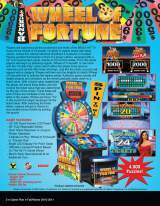 Wheel of Fortune is a one-player game. The Start button is displayed on the touch screen. The player spins the dial to rotate the wheel. Player chooses between classic WOF or Double Play game modes. 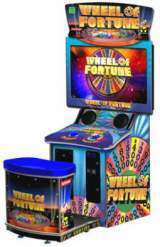 A classic WOF game is an operator adjustable one- or three-spin game. Double Play is a three-spin game and all wheel values are doubled. A word puzzle appears with a descriptive category. The player then spins the dial controller, which activates the replica wheel. The wheel slows and stops on a value. This value is awarded for each letter that is chosen by the player. The player selects a total of three letters. 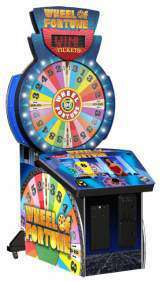 The tickets the player receives are based on the values of the total wheel selections. Game software developed by Play Mechanix, Inc.